A few years ago I decided to start using older tools. One of my favorite sayings for this is NeanderTools. The biggest reason for this was my kids. The only time I had to build things is when the kids are sleeping, or when they are playing in the back yard. Either way, I couldn't use loud or dangerous power tools. My favorite memory from when I started down this road was when I started re-sawing a large piece of Oak firewood into a thick board and my daughter who was then 1 1/2 started dancing under the saw dust. she couldn't reach the saw and I didn't have to worry about power tools throwing debris. At my old house I put together a little shop in the basement on the opposite side of the stairwell from the kids playroom, just for my Neander projects. I was stuck with the Cat's litter box and such, but at least I was out of the cold detached garage. My daughter loved to poke her head through the cat's entrance and watch me work. This picture shows the entire extent of that basement shop space. 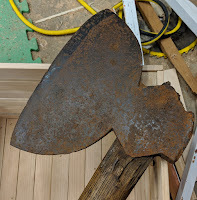 After many years of searching, I finally found a Broad Axe at my local flea market for $40. After much squinting and internet searches, it turns out this was manufactured by D.R. Barton in Rochester NY between 1849 - 1874 which means this is at least 144 years old. 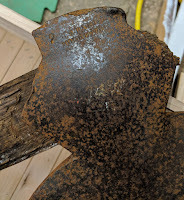 This is a 10" Broad Axe with a Number 2 on it, not sure what that means but I'm assuming it's for 2 lbs. Consolidated Tools Brace, I leave a 1/4" bit driver adapter in this for all my screw/bolt driving needs. It has a very smooth ratchet. This is a Stanley no 923 that I use for most of my drilling needs. My auger bit set in the original box, I have a few other misc bits to fill in the odd numbers not included with the standard sets. Millers Falls 77a enclosed egg beater drill. This is a very smooth operator with a nice side handle that i like. I had to replace the main handle as it was broken when I got it. Millers Falls No97 Continuous motion drill. This thing is so cool. The transmission actually allows you to set a ratchet mode where it will drill on a push stroke and a pull stroke of the handle. This is a direct replacement for my cordless 14.4v Dewalt drill that doesn't hold a charge anymore. I use it mostly with my pocket hole jig and any time I have to drill holes in Metal. Rip and Panel Disston #7. These were in tough shape when i got them. There were a few bends in them, they were not at all sharp, and the teeth were not set properly. I have since straightened them as best I could, sharpened them, and set all their teeth. These are amazing. I read lots about them online and how good they are but I didn't think anything could work better than my Keystone. I have been thoroughly proven wrong. I also picked up a 3rd Disston #7 which is a larger cross-cut saw. I have not cleaned it up or sharpened it yet since I'm not sure if I'm going to keep it. The Panel saw has done all the cross-cutting I need. One of the only new tools I own. This is a Lee-Valley dovetail saw. Moore Bros Back saw. This is the saw I let my Son use when he want's to make something. The teeth are are a strange cut that i haven't seen before, not sure if the previous owner didn't know how to sharpen or if this was intentional. It cuts just fine though. Sears Hand Plane, I use this for all my rough planing. I don't really care about it too much. I'm planning on grinding the iron into a scrub plane for the initial smoothing of the pallet boards I use for many projects. Siegley #31 Transitional Jointer Plane 24". Stanley #37 (Jenny) plane 13". This is my most used plane, I like it most of all. Molding planes. The only picture I have is the Before shot. The bodies cleaned up really well but I have not had enough time to tune the irons yet. Spoke Shave. This is one of the other few items that I purchased new. This is a hand crank grinder. I picked it up at an estate sale for $5 and installed a 6" Norton 3x grinding wheel. If you are thinking about getting one of these, I would say don't do it. Does it work? Yes, but it's VERY difficult to get an even grind because your body is moving around while cranking the handle. My shop mallet. I made this out of some heavy pallet boards. I'm pretty sure the head is oak but the Handle I'm unsure of. Possibly a form of Eucalyptus.